Is this an 18K antique gold band? My picture looks a bit washed out, but this is an old gold band that looks & feels like yellow gold- it has a nice gold luster and abstract etchings all around the outside. 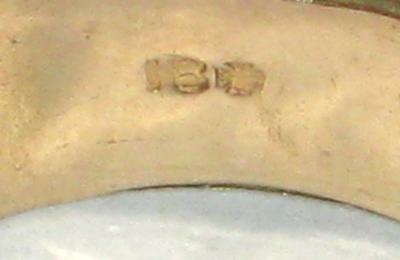 The hallmark has me stumped- it is an '18' with what looks like a templar or gothic cross next to it. Is this an old or foreign hallmark for 18K gold? ?